Sometimes a home just doesn’t have enough space to do all the things you want…or does it? Your home may actually have more space than you think; it just needs the right vision to maximize its potential. In order to make the most of the space available, Boston Closet is happy to help you with custom closets in Boston, as well as storage systems, including custom shelving, pantries, cabinets, and more! 1: Start with floor-to-ceiling bookshelves. By using the full wall from top to bottom you maximize storage in your home and create an attractive focal point. You’ll be amazed how many books you can fit on a single wall.. This might be a good excuse to head to the local bookstore and get more reading material to fill the shelves! Many parents even take advantage of the bottom shelf and add baskets filled with toys so the kids have easy access to their playthings. 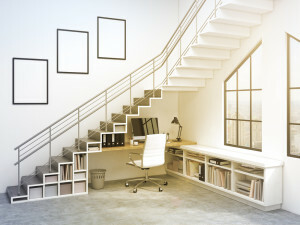 2: Put the space beneath your stairs to good use! Odd little nooks and crannies like this are perfect little stowaway spaces for a creative decorator. Custom shelving or cabinets could make this a cozy display for knickknacks, wine bottles and more. 3: High ceilings in kitchens or other rooms can make for a lot of “wasted” space. Install some custom shelving to put that free space to work for you! The floor-to-ceiling concept doesn’t just apply to books, so let Boston Closet help you use that space with customized storage systems and shelving units. 4: There are also a lot of little unused spaces in a home that can be cleverly turned into organized storage systems. Hideaway shelves and retractable drawers and cabinets can enable you to store a lot of stuff in traditionally small spaces like kitchenettes and bathrooms. Keep small appliances like toasters and microwaves hidden in the wall and pull them out when you need them, or keep towels and toiletries conveniently tucked away in pull-out shelves right by the bathtub! 5: If you have lofted bedrooms in your home, you can work absolute wonders with the free space underneath. An entire walk-in closet can be custom-designed by our professional designers to fit under the loft. Not only does this make a brilliant use of that space, but it adds a great touch of character to your home! Lofts are perfect for high ceilings, so consider building a loft in kitchen areas and living rooms too, if space allows. Boston Closet specializes is custom closets and storage organization in the Boston area, so if you’re looking to make the most of the space in your home, we can help! Contact us online or call (617) 628-1150 today and get a free design consultation!